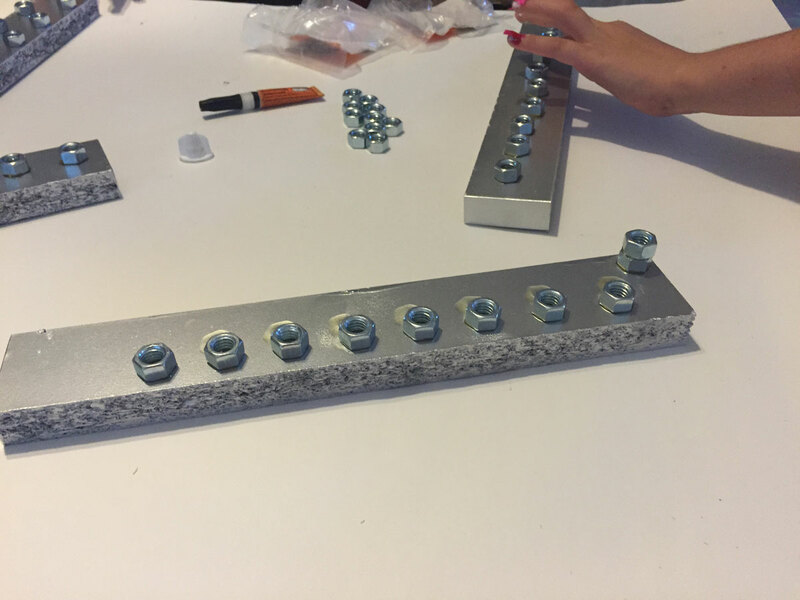 Making a Menorah. Making memories. Being anywhere from the age of three to grown up in a Jewish home meant making a menorah when mom needed to occupy you. It’s a thing. Hi. I’m Jenn. I’m a traditional Jew. That means I get all of the fun without any of the cumbersome religion. Your milage may vary. Torah-Praying-Jewish Law isn’t really my thing, but I could give you the low down on almost any holiday, feast, fast, event, why the calendar moves all the damn time, and why Jewish is both a religion and an ethnicity. But forget all that. Because today we’re making menorahs. I’m sure you’ve seen one. They pop up anytime from Thanksgiving to just after Christmas (that pesky lunar calendar!). They are everything from tiny to huge to simple to gaudy. I’ve even seen some that you can put on top of your car. I made my first wooden menorah when I was three. I was in nursery school at the JCC. We made all sorts of things there, but other than a clay dinosaur in a frame (don’t ask), that menorah was the only thing to make it to my adulthood. It was a simple wooden platform with wooden pieces and nuts glued on to hold the candles. My mumble year old menorah had a small accident a few years back. I mourned it for a minute and moved on. Why? Because we honestly had half a dozen more, made by me, by my siblings, by my kids, and we decided to use the one my grandmother brought from Israel that year anyway. My kids made some in Hebrew school when they were toddlers, but their school made them out of recycled tile. They were too heavy pick up, too fragile to use. I think they broke, because we only have homemade wooden menorahs left. I hit up Home Depot last week and picked up four pieces of scrap wood (score! scrap wood is free! ), 100 ⅜” nuts, gorilla glue, and spray paint. My kids thought they outgrew crafts. How wrong they were! something you will cherish for longer than you probably expect. I sort of forgot to photograph some steps. And since as of this writing it isn’t Chanukah yet, I don’t have a shot of it with candles (it is now, and I still don’t have one). Let’s forge ahead anyway! Take your spray paint and your wood and give it a good coat. You don’t have to do this, but like I said, I got scrap wood and it needed to be covered. I used the Rust-oleum in the photo. It is pretty shiny! I applied a super thin coat, and it dried pretty quick. Maybe 30 minutes before I was able to pick it up and get started on the rest of the craft. After the fact, I thought it would be nice to decorate these with Sharpies. We got to gluing first. So if you are artistically inclined, draw something fantastic on your wooden base. Can you tell I went into this without a clear plan of attack? Learn from my mistakes. As you can see, it wasn’t premium wood scraps. Some Sharpie or other decorations will go a long way in disguising that! Get to gluing! Spread a thin layer of Gorilla glue on the flat side of the nut. The side isn’t super important, so if yours are machined well, you may not have a side that is flatter than the other. Most of mine had a slightly rounder side, which I like to keep facing up. Decide where you want to put it, and stick it down. Yep, that easy. Gorilla Glue expands. Make sure it’s a thin layer and not glopped all over. You’ll notice in the photo below, someone was going to try to be all artsy and stagger her candle holders close together, and draw something on the open end. We then quickly realized that was a good way for all the candles to melt super fast and be a possible fire hazard once more than a few were lit. So a straight line might not be as fancy, but it’s probably safer. That’s it! 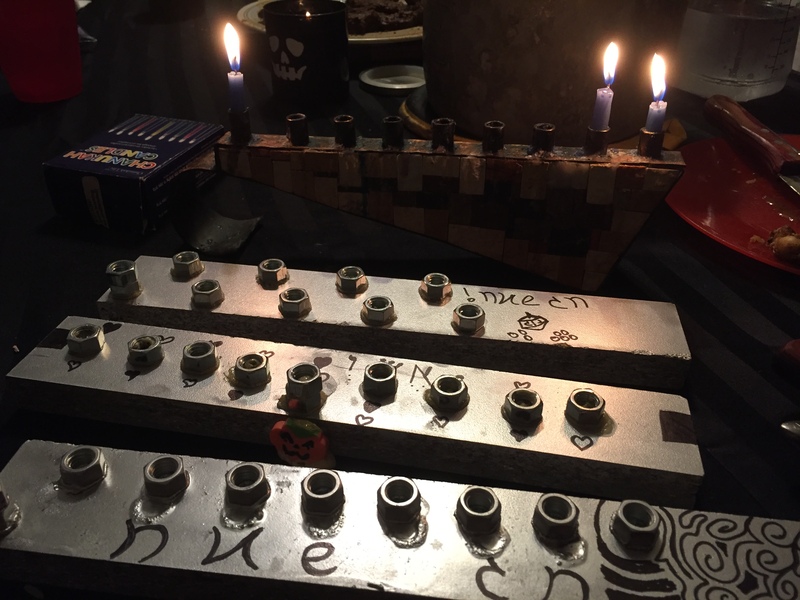 Make sure you glue on 9 nuts, and on one of them (either the middle one, or the end, usually) make it double, so the shamash can get it’s rightful raised place. Decorate as desired! My kids glued some plastic frogs on, even after we had the “that’s a whole other holiday!” discussion, but what can you do, right? Don’t group your nuts too close together, it could be a fire hazard with more than a few candles burning. I’m a traditionalist, one straight line for me! Try not to move them around once they’re glued on. The glue leaves a residue, no matter how well you wipe it off. My end plan for this lovely is to a) possibly paint it again to cover up the residue and b) glue a stack gelt (chocolate coins) and maybe a dreidel on the end. We had so much fun! and it’s so easy to whip up super quick, which is bonus for me!